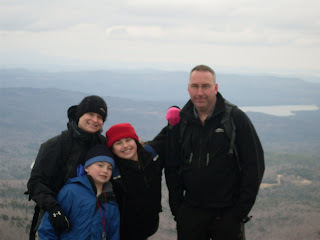 AMC's Great Kids, Great Outdoors: "Quality time at Greenleaf is hard to beat"
"Quality time at Greenleaf is hard to beat"
About twenty years ago, Tim Whyte was involved in youth and recreation programs in Saugus, Mass., where he lived and ran a construction company. He joined the Appalachian Mountain Club because he wanted to learn more about taking kids backpacking; he signed up for one of AMC’s Outdoor Leadership Training courses. “I found an incredible community of people,” he recalls. “When I got off the trip, I said [to the director of the program], ‘I want to do what you do.’” Tim ramped up his time in the outdoors and taught his first course in the Youth Opportunities Program in 1997. Shortly after that course, Tim’s daughter, Courtney, was born, followed a few years later by his son, Andrew. 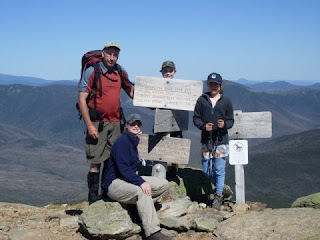 Tim continued teaching YOP courses, and his children learned to hike along with him. After he was divorced, Tim dealt with the challenging logistics of hiking trips as a single parent by asking other family members and friends along. At a YOP training class he met Erika Papi; he proposed to her at the end of a course three years ago, and the family of hikers expanded. This year, he took the leadership training students by Greenleaf. At the hut, he opened one of the hiker logbooks and read a couple of the entries aloud. Afterward, he asked them, “Do you know why I read those? Because they were written by my son and daughter.” He wanted the students to understand that the log entries condensed a powerful experience. Courtney and Andrew, he told them, can come back in one year, two years, or twenty years, read their entries, and remember that experience all over again.